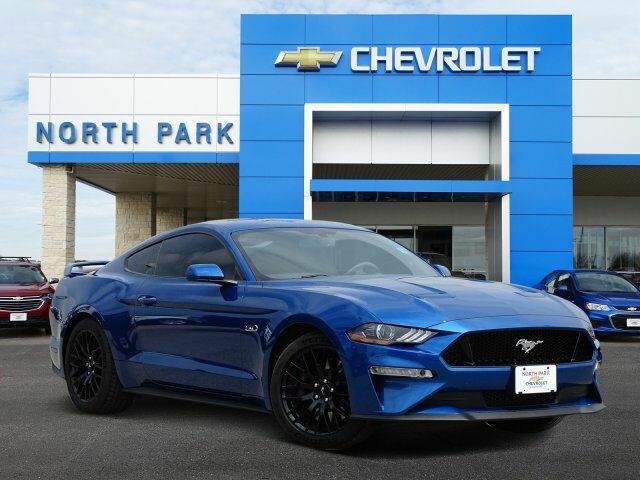 GT trim, Lightning Blue Metallic exterior. CARFAX 1-Owner, LOW MILES - 1,542! iPod/MP3 Input, CD Player, Back-Up Camera, GT PERFORMANCE PACKAGE, ENGINE: 5.0L TI-VCT V8. SEE MORE! GT PERFORMANCE PACKAGE Brembo 6-piston front brake calipers, K-brace, performance rear wing, silver painted strut-tower brace, unique chassis tuning, unique electronic power assisted steering, unique anti-lock brakes and upsized rear sway bar, Engine Spun Aluminum Instrument Panel, HD Front Springs, Larger Radiator, Wheels: 19" x 9" Fr & 19" x 9.5" Rr Ebony Black Painted aluminum, Larger Brake Rotors, Unique Stability Control, Tires: 255/40R19 Fr & 275/40R19 Rr Summer-Only Designed to optimize driving dynamics and provide superior performance on wet and dry roads, High performance summer tires wear faster than non-performance tires, Ford does not recommend using summer tires when temperatures drop to approximately 45 deg F (7 deg C) or below or in snow/ice conditions, Gauge Pack (Oil, ENGINE: 5.0L TI-VCT V8 (STD). Rear Spoiler, MP3 Player, Keyless Entry, Steering Wheel Controls, Bucket Seats, Electrochromic rearview mirror, Brake Assist.